One of the many benefits of raising backyard chickens is the knowledge that the eggs I cook and bake with are fresh and have been handled properly. I feel confident making recipes that include partially cooked eggs as long as I am using eggs laid by our hens and try to include many varied egg dishes in our family's weekly menus as well as our holiday menus. Eggnog is a holiday tradition at our house. Our fresh eggs, along with some scraped vanilla bean and freshly ground nutmeg, make my eggnog truly a guilty pleasure guaranteed to deliver plenty of holiday cheer. Adapted from a combination of Martha Stewart's Classic Eggnog recipe and Emeril's Eggnog recipe, I think you will agree that my eggnog is worthy to be served all through the holiday season to special friends and family. Whisk the 8 eggs plus 4 additional yolks with the sugar in a medium bowl until pale yellow and thick. Heat the 2 cups heavy cream, milk and scraped vanilla bean in a large saucepan over medium-low heat, whisking until hot. Add about a cup of the milk mixture into the whisked egg and whisk to blend, then pour the egg/milk mixture into the hot milk in the saucepan and continue to cook, whisking, for about 3-5 minutes, or until thickened enough to coat the back of a spoon. 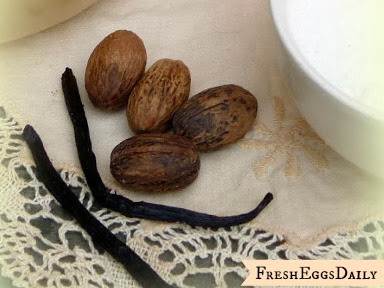 Add the vanilla bean paste, nutmeg and liquors to the eggnog and stir well. In a small bowl, beat the 4 egg whites until soft peaks form and then gently fold into the eggnog. In a clean chilled bowl, beat the remaining 1/2 cup heavy cream to soft peaks and fold it into the eggnog. Refrigerate until chilled, then garnish with additional fresh grated nutmeg and serve. For more information on Salmonella and how to prevent it, read HERE. That looks really tasty. I can't wait to make some. Thanks for sharing. The picture of this look divine! What a classic holiday drink! I've never had homemade eggnog, but this looks delicious. 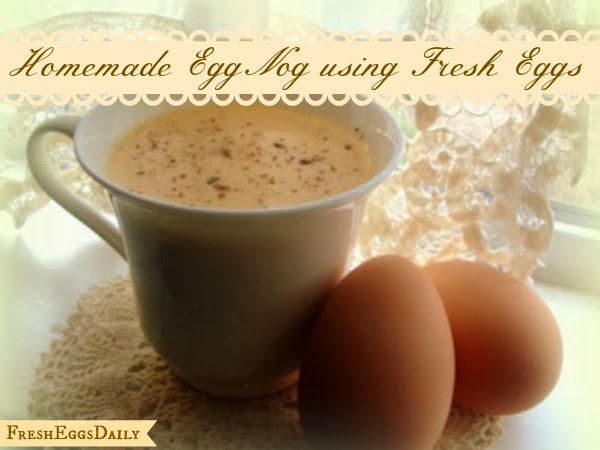 I can't wait to try this with my girls fresh eggs! It sounds wonderful. My family loves eggnog, and I have kept chickens for years, but can you believe I have never made my own? Thanks for the encouragement! I love eggnog. This sounds delicious. Thanks for sharing on Foodie Friends Friday. Please come back Sunday to vote. This looks and sounds delicious! I've never made egg nog. I think I'm going to have to give this a try this Thanksgiving. (If I try everything you've shared and I like, I'll be busy for weeks!) Thanks for sharing your recipe. This sounds fantastic! How long does it last in the refrigerator? I don't know that we've ever had any last more than a day or two. I would say just a couple of days to be on the safe side but with the alcohol in it, that should kill anything! OH my husband would love me forever if I made this for him! :) He LOVES egg nog and I admit this sounds way more delicious than the bottled kind! Thanks for sharing this on Saturday Show & Tell on Cheerios and Lattes this week! We love having you join us! Have a great week! Congratulations! I picked you as the post to feature in this week's Eat Make Grow Blog hop. I'm giving the recipe a try after Thanksgiving. Perhaps it will be added to our Christmas traditions. :) Thanks for submitting. Oh thank you! I wasn't sure it was actually considered 'healthy' enough, but with fresh eggs you just can't beat it! That looks delicious!!! I've never had real eggnog before! Hey Lisa...this sounds delicious...do you think it would be alright if i eliminated the alcohol? My familky don't do alcohol, so i was just wondering.